Creatine helps provide the energy your muscles need for everyday activities. It also supplies the extra spurt of energy that sustains and boosts muscle power during high-intensity exercise. Meat is a good choice for adding to your stores of creatine. In addition to containing natural creatine, it has the amino acids your body needs to produce its own supply. Your body produces creatine from three amino acids -- arginine, glycine and methionine -- then it's stored in muscles, where it can be converted into phosphocreatine and used for energy. The amount of creatine you can store depends on your total muscle mass. When you increase the amount of dietary creatine, you can boost the levels of phosphocreatine in your muscles, which helps improve athletic performance, according to a review in the October 2014 issue of "Sports Medicine." To boost performance, athletes often use supplements and follow a creatine-loading regimen. Meat is one of the primary sources of creatine. Beef has about 5 grams of creatine for every 2.5 pounds of meat, according to Iowa State University Extension. You'll also get about the same amount from pork. Since 2.5 pounds of meat is enough for 13 servings, one 3-ounce serving of beef has about 0.4 gram of creatine. As a general guideline, any type of uncooked muscle meat has 3 grams to 6 grams of creatine per 2.5 pounds of meat. Beef and chicken lose about 5 percent of their total creatine when they're cooked, unless they're boiled or stewed. When the meat is braised for a long time, you may lose as much as 30 percent of the creatine. Beyond beef, chicken and pork, your other choices for creatine-containing foods are wild game and fish. Wild game is one of the richest sources, reports the University of Maryland Medical Center. The amount of creatine in fish varies. Some types of fish, such as tuna, salmon and cod, have about the same amount of creatine as you'll get from beef. Herring is a better choice because it can have up to double the amount as other fish and meat. On the other hand, shrimp contain barely a trace of creatine, according to the University of Oregon. Your body needs about 2 grams of creatine daily just to perform normal activities, according to the University of Oregon. 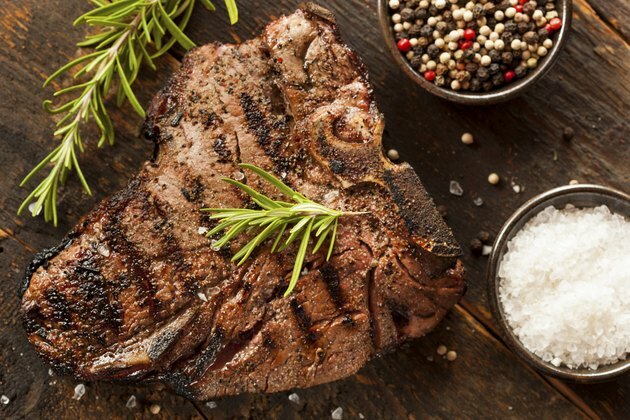 A typical American diet that includes meat provides 1 gram to 2 grams of creatine each day. Since creatine is found in the same animal proteins that also supply the amino acids needed to synthesize the compound, the best way to be sure you get the amount you need is to consume your recommended daily protein from lean meat, poultry and fish. For women, that means getting 46 grams of protein daily, while men need 56 grams. Can Women Take Creatine to Lose Weight? Is it Bad to Take Creatine Before Bed?